So make sure to bookmark this spot and come back between 10 PM – 11 PM ET for our Chicago Med recap. While you wait for our recap make sure to check our Chicago Med recap, spoilers, news & more, right here! Tonight’s Chicago Med recap starts now – Refresh Page often to get the most current updates! Chicago Med begins tonight with Dr. Connor Rhodes (Colin Donnell) driving off to work in his brand new Porsche. He is met by Dr. Ava Bekker (Norma Kuhling) who can’t help but comment on his new wheels and attitude as he is checking out as a woman outside the hospital, wondering if she is interested in him or the car; he doesn’t know but goes to find out. 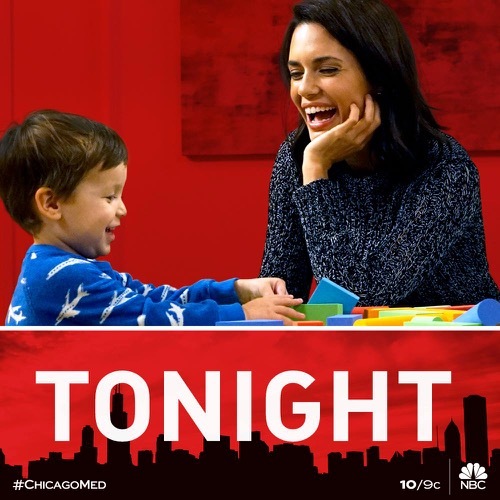 Dr. Natalie Manning (Torrey DeVitto) comes downstairs to Dr. Will Halstead (Nick Gehlfuss) playing with her son, Owen (Ari Morgan). Suddenly, Owen throws a block at Will’s face and neither is sure what happened, but Will is startled. Outside the hospital, Dr. Ethan Choi (Brian Tee) and Nurse April Sexton (Yaya DaCosta) are talking about how little they have in common; Ethan insists it is “opposites that attract.” April gets her latte and goes inside as Ethan is called over by a stranger who says a woman is lying on the ground 2 blocks over and isn’t moving. A passerby has called 9-11, but Ethan says she is barely alive and they cannot wait on the paramedics and runs with her in his arms back to the ED. Inside the ED, Nurse Doris (Lorena Diaz) helps cut her clothes off, she is bundled up and see there is nothing to her. She is very skinny and her hair is brittle and thin; immediately, Doris says “anorexia.” She is jaundice and as Dr. Choi exams her he can feel right through her to the bed underneath. She begins to wake up, telling him her name is Allison, she quickly loses consciousness again and he orders several tests. Dr. Halstead comes to see his first patient Asterid Morgan (Lisa Beasley), who tripped as she was racing to the train. When he exams her, she tells him about her back hurting too. Maggie Lockwood (Marlyne Barrett) is working double shifts again and working with him. She comments on his black eye, and he swears it wasn’t his fault. Dr. Daniel Charles (Oliver Platt) welcomes Dr. Sarah Reese (Rachel DiPillo) back from her suspension, and they are ready to “ease back in” but a patient is brought in and Dr. Stanley Stohl (Eddie Jemison) puts them right to work. Ethan rushes over and Sarah immediately says she can do the assessment on Jane Doe, while he takes over with Allison. Ethan welcomes Dr. Reese back when she reassures him that she is good. Allison knows that Dr. Charles is a “shrink.” She knows they are not just giving her saline in the IV, and quickly begins to calculate how she needs to burn off the extra calories. She tells Dr. Charles she doesn’t need to be there and to check all her levels as they will be fine. Does he want to know what the go-to trick is to game those numbers? He figures out this has been going on for at least 15 years and she says she wants to go home. He puts down the rail and tells her she can go, but she literally cannot lift herself up to go. Dr Charles says that since she can’t, she knows what that means and they begin to negotiate numbers; settling on 3,000 calories and it has to be through her nose and he agrees to no more IV. Dr. Reese is unable to make any headway with Jane Doe and asks Maggie to give her some medication to calm her down and then she will try again. Dr. Manning meets with patient Tommy Oliver (Corbin Bleu), who insists he only has barely a fever. Dr. Manning orders several tests; meanwhile, Maggie finds Will has a book called “Toddler and Me”, he is trying to figure out how to get Owen to like him. She gives him Asterid’s scans and tells her that he needs Conor and Neurology. Dr. Choi is angry that Dr. Charles agreed to 3,000 calories, saying Allison is 5’6” and less than 70lbs; but Dr. Charles explains that is all she is willing to accept. He says anorexia is the deadliest mental illness that there is, and every instinct she has is telling her to resist this and he can’t push her any harder than she will let him. They have to honor this deal; they are interrupted when Maggie tells them Allison’s parents are in the waiting room. Sarah asks Daniel if this is the worst case he has ever seen and he says a healthy BMI is 18-25 and she is 11; if she is going to stay alive, they can’t afford to make any mistakes. Sarah realizes she is killing herself but Daniel distracts her, asking about Jane Doe. There is no ID, tox screen is clean; Sarah wants to double the medications as what she has prescribed hasn’t made a dent. Dr. Charles tells her to humor him and check all the boxes before she goes any further, she reluctantly agrees. Dr. Manning and April return and inform Tommy that he doesn’t have strep throat, but his body is most likely fighting off a bacterial infection, so she is going to start him on an oral antibiotic and recommends bed rest as the best medicine. He attempts to get out of bed but complains about pain in his ankle and Dr. Manning suggests taking a look, he removes his sock and it is hot, red and fluctuant. She wants to take a sample, gives him several injections and tells them they need to stick around; both Natalie and April are worried about the infection traveling that fast. Dr. Rhodes informs Asterid that she has a tumor that starts inside her left kidney and goes into the right atrium of her heart. She never had a sprain in her back and the exhaustion from going up the stairs was the blockage of blood going back to her heart. She is trying to find a joke to cope with it, as she is a stand up comic. Will promises they will find a joke after she beats this. She informs them, she doesn’t have health care plans to pay for the surgeries. Dr. Rhodes says Medicaid covers all of the expenses. Dr. Choi instructs Allison on what to do when she gets the tube put into her throat. Dr. Charles talks to her parents, who explain that they hope this will work this time, as they have tried to help her for years. She hates watching as the food approaches her body and yanks it out just before it enters her body. She refuses them doing it again and tells them she is done. She tells them she wants her lawyer, and for them to call him NOW! Dr. Rhodes and Dr. Bekker are doing Asterid’s surgery, they are able to remove the entire tumor with the left kidney as will watches from the gallery; Ava can’t help but tease Conor about his date tonight with the girl he met outside the hospital that morning. Dr. Sarah Reese stands outside Jane Doe’s room, listening to her ramblings when Maggie tells her that CPD just called about a woman named Melissa Withers who filed a missing person’s report on his sister, Jamie, and her description matches Jane Doe. April runs into Tommy’s girlfriend outside the vending machines, she doesn’t want to leave Tommy’s side to even go to the cafeteria. Natalie tells April that the wound on Tommy’s ankle is a staph infection, and they need to switch to an IV medication as they need to be more aggressive fighting it. Dr. Charles informs Dr. Choi they will not be doing another feeding tube because Allison has been preparing for this moment; had papers drawn up, preventing forcible feeding and the hospital lawyers do not want to fight it. Ethan wants the parents to fight it, but Daniel reminds him that Allison is an adult and ultimately she decides her own fate. Dr. Charles explains that the odds of her recovering from anorexia are not likely, as she has been fighting for control of it for 15 years. Asterid is awake from her surgery, and all things considered she is feeling fantastic and jokes that at least it didn’t cost her an arm and a leg. She thanks, Dr. Rhodes and Dr. Halstead, but asks them about her right leg being achy around the shin; outside the room, they both know its not from the anesthesia but they want an x-ray done. Tommy is unable to breathe, he calls for Hannah. His temperature is up to 104 when April and Dr. Manning come in. He is in septic shock and they are unable to find any abscesses; Natalie is worried as he should be getting better but he is only getting worse; she sends April to get him a cooling blanket. April talks to Natalie at the desk, who reveals on his latest labs he doesn’t have a staph infection, after all, he has the superbug; one that isn’t easy to get. It only lives in hospitals. April explains that Hannah had pneumonia 10 years ago and was hospitalized for a couple weeks, she could have picked it up, they need to swab Hannah to see if she is an asymptomatic carrier. April sees Ethan watching Allison and her parents and comforts him briefly at the desk before she continues on with her work. Dr. Reese updates Dr. Charles on their Jane Doe being Jamie Walker, an aspiring chef in culinary school. About a month ago she started reading the Bible, staying up all night and began writing a manifesto. Last week, she dropped out of school and hasn’t been seen home in 4 days, so Sarah’s original findings plus her all this new found information leads her to believe bipolar mania. Dr. Charles asks about the blood work and lad results, Sarah reveals she never got to them. He reminds her that they were supposed to be checking all the boxes and going by the book. She says she confirmed her diagnosis and asks if it matters how she got there. He says she is on probation and it matters how she got there! She wants to check her into the psych ward and talks about the medication she has put Jamie on. Dr. Charles says with bipolar disorder, those meds should have made a dent, so now he wants to take a look. Dr. Halstead and Dr. Rhodes learn that the cancer is also in Asterid’s tibia, they are discussing forms of treatment options when Sharon Goodwin (S. Epatha Merkerson) interrupts them, informing Connor and Will that she is transferring Asterid to a safety net hospital because she doesn’t have insurance and the hospital won’t cover the bill her treatments will generate; Medicaid covers the removal of the tumor but not the bone cancer. They both feel she fell through the system before but Sharon thinks they are living in a dream world as they are talking about $100,000 to $200,000 easily; she asks if they want her to inform the patient? Dr. Charles and Dr. Reese come to see Jamie and her sister, Melissa. Dr. Charles checks Jamie’s eyes and notices something is off, but Dr. Reese won’t even approach the patient to look in her eyes. Melissa is able to tell them that Jamie uses copper pots in culinary school and this could explain her manic episode as she has Wilson’s disease. Dr. Charles says there is a treatment for it, and she could get better; outside the room, he is about to question Dr. Reese about not being able to touch her patient when Dr. Choi’s patient Allison has lost her pulse. Dr. Choi shocks Allison twice and he attempts to resuscitate her, until her father pleads with him to stop, saying she has suffered enough. He calls her time of death as 18:21 and leaves the room. Hospital transfer arrives and Dr. Halstead shows them where to go. April explains the situation to Tommy and Hannah, he tells her they will figure it out, but she is devastated that she could get him sick again. Will is furious that they do everything right and Asterid will still fall through the cracks. Connor can’t take anymore and orders them to stop. He overrides the order, saying he will take care of it and signs the paperwork. Will asks him what he is doing and he assures him he knows what he is doing. Daniel finds Sarah crying, who says she did her therapy and suspension; she is supposed to be a psychiatrist and she couldn’t even look her in the eye. He says the good news is that she recognized the problem and no one learns to master their fears in two weeks, not even someone as determined by her. She pleads with Dr. Charles to help her and he promises her he will. Dr. Manning asks April how it is going and she says things are going well as Hannah and Tommy haven’t been able to take their eyes off each other; but when Hannah comes out of the room, April offers her pamphlets on how to handle the health risks between her and Tommy; Hannah tells her she doesn’t need them. She asks April to give Tommy this envelope she has, saying she can’t tell him herself, she loves him but can’t put him at risk. She walks out. April says dealing with TB and the pressure it put on her and Tate’s relationship, she gets it. April finds Ethan in the locker room, they hug each other as he looks at her, she says “same here,” as they hold each other tightly. At home, Natalie is watching Owen as he plays with his blocks. He smashes his blocks down when Natalie goes to the door and lets Will in. He brings in a big truck, explaining he read on child development and the best thing could simply be a bribe. Owen says he likes the truck but as Will asks him to take if, for a spin, he throws another block at his face, hitting his other eye. Will stands up, asking Natalie if he hates him, Natalie assures him he doesn’t. Sharon runs into Dr. Rhodes in the hallway and confronts him about Asterid’s transfer being unnecessary. She knows about the 6 figure anonymous donation and he says it was just good timing. She advises him to be careful because patients will keep coming and as wealthy as he may be, his checkbook won’t be able to keep up. He says it did for today!